Usually held on the first Saturday of every July, the annual Durban July is South Africa's equivalent of the Royal Ascot in the UK, with superb thoroughbreds, but also high fashion, fine cuisine and elegance. It is the premier horseracing event in the country, where the rich and famous go to see and be seen, and is the most talked about social gathering among racing enthusiasts. A love of horse racing is by no means required to enjoy this social extravaganza and even those completely unfamiliar with the sport will be hard pressed not to get caught up in the excitement of the day. 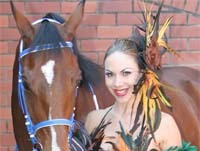 About 55,000 people attend the Durban July and millions more watch the event on television. There are numerous restaurant facilities, corporate suites and VIP tents in the Greyville Racecourse's Marquee Village. The more glitzy options often sell out months in advance and it is worth booking early if you want special treatment, but there are many more informal restaurant and entertainment areas which can be just as much fun. It is estimated that about R200 million is placed in bets during the Durban July! For more details on the event check the official website listed below.